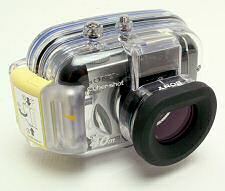 In case you happen to be headed to warmer climes on your upcoming holiday (you know, palm trees, azure waters, brilliant sun, warm wafting breezes), there's an excellent article at Divernet reviewing and comparing seven affordable underwater digital cameras. The article is written by John Bantin and Rob Hancock. Keep in mind that nature pictures of colorful little creatures on reefs is not the only use for such cameras; they can be handy for art photographs made at beaches and in pools too—Aperture put out a nifty little collection in 1988 called Swimmers that was chock-full of such appealing people-near-the-water pictures. Snap away! On Divernet, I particularly like the pictures of the guy standing next to the test charts...underwater, naturally.